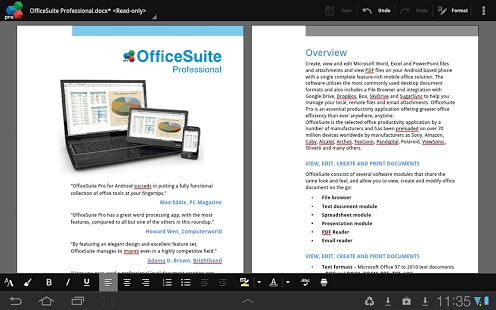 OfficeSuite lets you easily view, edit, and create Word, Excel, and PowerPoint documents, convert to PDF, and manage your files all with the most feature-rich mobile office solution available for Android smartphones and tablets. • View, create and edit complex office and attachments all from a familiar desktop-style interface. • Full compatibility with Microsoft formats including DOC, DOCX, DOCM, XLS, XLSX, XLSM, PPT, PPTX, PPS, PPSX, PPTM, PPSM. • Support for PDF files including PDF camera scanning and Export to PDF. • Additional support for common formats like RTF, TXT, LOG, CSV, EML, ZIP; Open Office – ODT, ODS and ODP – support (available as in-app purchase). 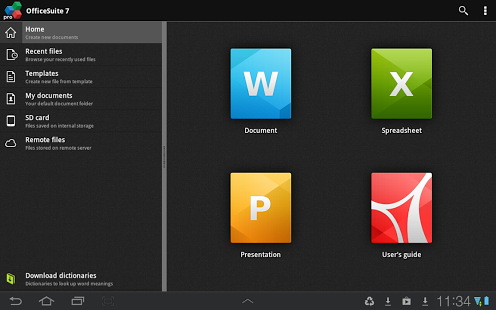 • Preserve document formatting and layout and use advanced editing features like never before on a mobile platform. • Integrated File Browser for quick and easy access to both local and remote files including Recent files, My Documents folders and document templates. • Sharing via cloud services like Box, DropBox, Google Drive, OneDrive, Amazon Cloud Drive and SugarSync, as well as over email, Bluetooth, and Wi-Fi Direct. • Available in 56 languages. • Support for multiple keyboard shortcuts including moving of objects and selections. • Format Painter in Word documents. • Security features – work with password protected files. • Insert pictures using your camera or from an external file. • Additional options in Excel including Insert Filter, Conditional Formatting, Define Name, Import Image, Edit Chart, and Save as CSV. • Edit transitions in PowerPoint slideshows. •Support for Android 8 Oreo. •Convert and open files created with Apple Pages, Numbers, or Keynote apps. •Integrated spell check in Spreadsheets and Presentations. •Filter Web images on size, type, colour and licence. •Create shortcuts to your favourite files and folders on the device Home screen. •Insert and delete entire cell ranges for advanced spreadsheet editing. •Stability improvements and bug fixes.